It supports in iOS7, Safari 6.1+, and Safari 7. Here you can find some tips for applying the method in different browsers. 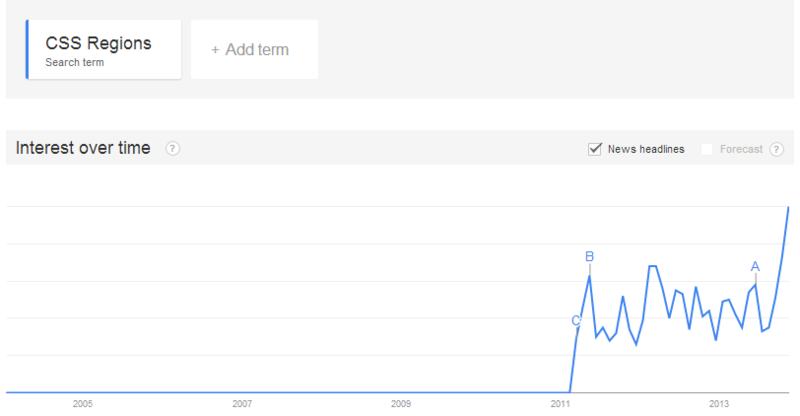 Google Trend (see screenshot below) shows that search for the word ‘CSS Regions’ jumped up especially in this month. Recently, the use of CSS Regions has increased! You can separate content across multiple containing elements. It creates a flow consists of content that may appear within multiple elements. Also, a region chain, which is the collection of elements the flow is spread across. Once if you have defined the elements, the flow will fill the elements dynamically in the region chain. You can then size the containers vertically. Here, you will get the new opportunity to do not worry about the content getting cut off. It will simply overflow into next element in the chain. You need to start by creating a named flow to use regions. Add the CSS property flow-into to the content element, with the value of your flow’s name. Then, apply the CSS property flow-from with the value of your flow’s name for each region through which you want the content to flow. 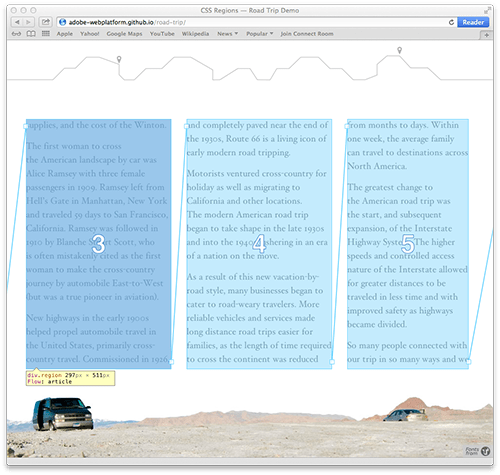 The content element will flow through the region elements. Current implementations in browsers require the property to be prefixed, but we are using the un-prefixed version here. A content element and the scaffold of all of the regions would be containing by your HTML that this content will flow through. The content element will not be shown in its original location when you work on regions. Also, any HTML already in your region elements will be disappeared and it will be replaced by the content being flowed into them. For this reason, we can have placeholder or alternative content within our region elements. The content being flowed is not a child of the region elements. Only changing where the content is displayed. According to the DOM, everything remains the same, so the content does not inherit styles from the region in which it lives. Instead, the specification defines a CSS pseudo-selector, ::region(), which allows you to style the content within a region. Apply the pseudo-element to the region’s selector and then pass a selector as an argument, specifying the elements that will be styled within a particular region. To fit the content within the region properly use the fit value. It will fit either completely (if earlier in the chain) or partially (if the last region of the chain). These events will respond depending upon the content, design and the layout. To change layout apply classes. These classes will be applied to add or remove regions dynamically. For more detail use Christian Cantrell’s article “Web Inspector Support for CSS Regions“. Region has opened up many opportunities in the field of responsive web design for all kind of platform and devices. Adobe’s demo for a bike company, created with Edge Reflow. Follow @adobeweb for the latest updates on regions and other new Web features. Also, be sure to check out Adobe’s CodePen collection, which shows regions in use; you may want to fork one or more of the examples to explore different ways to use regions. peoples like enough articles like you really have an idea what they think what they want and what they like so thats whey you wrote that beautiful article, thanks.